Was a member of forces engaged in clearing mines from the approaches to the harbors of NAKGUSUKU WAN, KINMU WAN, and OKINAWA SHIMA from 3rd to 10th April 1945. Referring to the latter activities the Commander of the Eastern Fire Support Group sent the following message, in paraphrase. 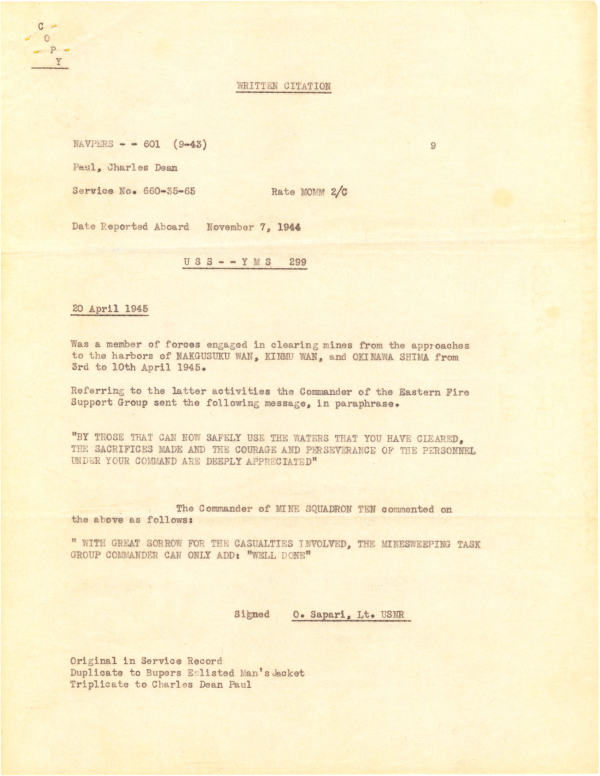 This entry was posted on November 7, 1944, 8:00 pm and is filed under Documents, During Battle, War Context. You can follow any responses to this entry through RSS 2.0. You can leave a response, or trackback from your own site.